It is spring in Chamonix and finding good skiing becomes a bit difficult. The last snowfall came with strong wind, and everything that faces the sun for at least a couple of hours is sliding off. But the technical skills were quite high, I’d say normal for Chamonix: A group of 4 guides had already prepared the rappel, while we (two) and a group of another three guys went up the southern slope of the Col du Capucin. Fast rappels, facing backwards, with skis on. Always two people skiing and two on the rope worked perfectly. From the Col we all reached Leschaux Glacier in less than one hour. The couloir itself was sluffed off, the lower half skied really well, while to top section was quite a struggle with the own mind. We all met in town later the day: Using their ropes in exchange for some cold beers is a square deal. Its hard to capture the steepness. But maybe you try to reach the floor with your right hand making a fist, while standing upright. Totally high on Glacier Leschaux. 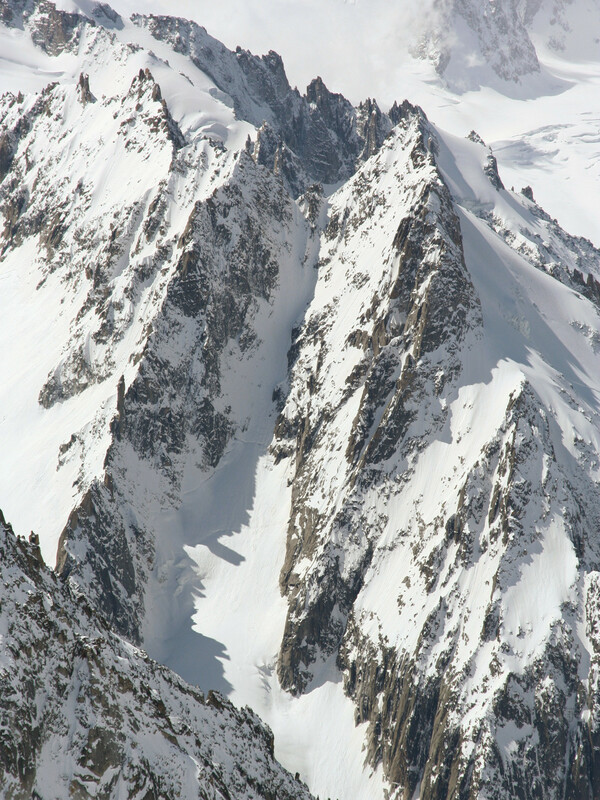 Unbeatable scenery with the Grandes Jorasses in the back. Posted in SkiingBookmark the permalink.